"This is a really old recipe that I've had forever. They're simple but good. 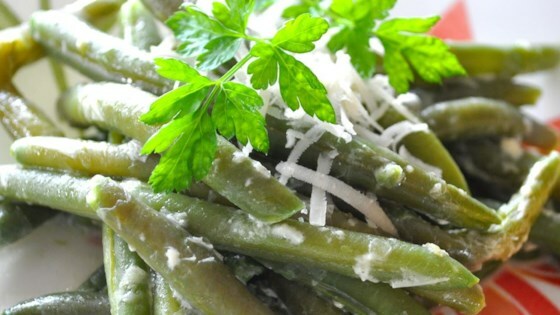 You can substitute 1 pound of asparagus for the beans if you'd like." Bring a large pot of lightly-salted water to a boil; drop in the green beans and return to a boil. Cook uncovered until the beans are bright green and barely tender, about 6 minutes. Drain and set aside. Melt the butter in a large skillet over medium-low heat; whisk the cream, 2 tablespoons of Parmesan cheese, and nutmeg into the melted butter. Bring the mixture to a simmer. Gently stir the beans into the mixture to coat; season with salt and pepper. Return to a simmer, transfer to a serving dish, and sprinkle with 2 tablespoons of Parmesan cheese to serve. Excellent! The sauce is amazing and would be great on lots of other veggies and maybe even meat. The nutmeg is a must! DON'T LEAVE IT OUT. Very Good. I followed the recipe exactly. My boyfriend wishes I had made more. Will make again!